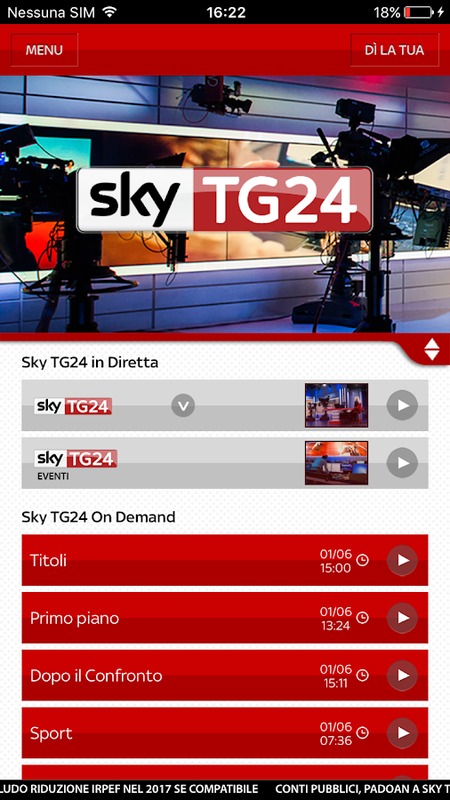 Sky TG24 keeps you updated anywhere, 24 hours a day, 7 days a week,on your Smartphone and Tablet.The App offers you the live streamingof the channel Sky TG24 with all updates from Italy and the world,plus:- Sky TG24 Eventi channel- The News bulletin titles and thelatest news videos- SkyTG24 Active videos on demand, to always haveat hand the main news, the insights, the national and internationalnews, the press review, sports and much more- Exclusive clip ondemand- “Di’ la tua” section which allows you to answer the “Ladomanda del giorno” and express your opinion during the livestreaming of the cannel Sky TG24- And the "ticker", the continuousscrolling text to read whenever you want the latest news in realtimeThe download is free, and you can try the App for free for 30days, and afterwards you can decide whether to subscribe at€1.99/month. Should you not, you will still be able to participateto the survey “Sondaggio del Giorno” and express your opinion inthe section “Dì la tua”, but you will have access only to the newson SKY TG24 ticker.you will have access only to the news on SKYTG24 ticker. Tutto è pronto per la prima stagione diCelebrity MasterChef Italia. Oltre a rimanere sempre aggiornatisulle novità di questa edizione, conoscere i segreti dei tregiudici più esigenti della cucina italiana: Bruno Barbieri, JoeBastianich e Antonino Cannavacciuolo, potrete rivivere le emozionidel cooking show più amato della TV attraverso video efotogallery!©2017 Endemol Shine Group B.V. Endemol Shine, MasterChef and theMasterChef logo are registered trademarks of Endemol Shine Group BVand used under license. All Rights Reserved.MasterChef is based on a format by Franc Roddam and is produced byEndemol Italia S.p.A. for Sky under license from Endemol ShineGroup BV in association with Ziji Productions Limited.Everything is ready forthe first season of Celebrity MasterChef Italy. In addition tokeeping up with the novelties of this edition, learn the secrets ofthe three most demanding judges of Italian cuisine: Bruno Barbieri,Joe Bastianich and Antonino Cannavacciuolo, you can relive theexcitement of the most popular TV cooking show through videos andphoto gallery!© 2017 Endemol Shine Group B.V. Endemol Shine, MasterChefMasterChef and the logo are registered trademarks of Endemol ShineGroup BV and used under license. All Rights Reserved.MasterChef is based on a format by Franc Roddam and is produced byEndemol Italy S.p.A. for Sky under license from Endemol Shine GroupBV in association with Ziji Productions Limited. The Sky Sports Football Score Centre app is your go to app for livescores and watching Premier League goals… Get in there, what aresult! As well as videos of all the goals, you can watch matchhighlights, check out the latest scores and results and staybang-up-to-date with the big football stories from Sky Sports News.And it’s not just action from the Premier League. You’ll find videofrom the EFL, La Liga, MLS, World Cup qualifiers, Eredivisie andeven the Chinese Super League. The in-game goal clips from everyPremier League match are available to Sky TV customers with a SkySports subscription. So, if you’re not a subscriber, now’s the timeto make that savvy call. If that’s a step too far for you, you canstill watch loads of firecracker Premier League action as long asyou sign in with a free Sky iD. The Football Score Centre’sbrilliant alerts service will make sure you stay ahead of the gameand see all the major talking points before your mates. And you canachieve super-fan status by personalising your home page withup-to-the-minute information on your team. If you’re interested inthe scores of more than one team (it’s OK, we won’t tell your matesyou support two clubs! ), you can choose the scores and competitionsthat matter to you using the ‘My Scores’ section. So, make sureyou’re a top-flight football fan by downloading the Football ScoreCentre now. It’s got all this: • Video highlights for every PremierLeague and English Football League game • Notifications for yourteams, including in-game goal clips and Premier League matchhighlights for Sky TV subscribers with Sky Sports • Brand new videosection including dedicated areas for your chosen team, trendingvideo, Premier League, Football league and other major leagues •Match pages showing live scores, commentary, team line-ups andenhanced match stats to keep you up-to-date on all the action •Match reports, previews and a dedicated news section • Live updatedleague tables including all the domestic, European and majorleagues and tournaments • The Sky Sports News Vidiprinter. Followthe goals as they go in with our new and improved Vidiprinter • Thenew picture in picture video mode means you can watch goals,manager interviews and more whilst using other areas of the app –so you don’t need to miss any of the action Please note thisversion supports Android 4.2 (SDK 17) and above. Get all the news from the most popular league in the world. Enjoyongoing premier league updates, news, editorials of our mostimportant journalists.Stay in the picture 24/7 with professionalsky updates. This app is your chance to live your passion forfootball in a whole new way.Contact us on [email protected] forfurther info. Sun was shining, the birds in the sky, that is how perfect daylook. Download "Sky HD Wallpaper" free apps, even enjoy thebeautiful blue sky in the dreary rain images. This free HDwallpaper application has multiple sky amazing pictures that willmake your day, and remove all the rain clouds overhead. Skybackground image to present you the most beautiful and romanticscenery, which will make your phone looks refreshing. Blue livewallpaper is here to personalize your phone, and show all thepeople of your optimism. How to install: Home → Menu → Wallpaper →Sky HD Wallpapers Cool features: - Selection of HD wallpapers tochoose from. - The wonderful effect of making each one a blue skywallpaper HD looks like the best animated sky background - SkyWallpaper fully supports mobile phones and tablet devices. - Sharesky this application on social networks Select a dynamic wallpapersky weather cheer up and relax. You'll feel better in the second,because the sky is blue will calm you down, slowing the heart rate,comfort, encourage mental activity and concentration. Blue is thecolor of peace and rest. So, you'll see how much blue sky dynamicwallpaper will improve your mental state. Choose your favorite timeof day, and set a sky wallpaper, reflect your mood. If you like themorning time, you can choose fresh, clear sunrise live wallpaper,if you like sky with some of the more intense colors, like pink,purple, orange and yellow, then you should decide dynamics sunsetwallpaper. These wonderful sun wallpaper will cheer you up and putsome worms color in your life. White clouds in the blue sky looksgreat, especially when the light rays go through them. So, do nothesitate to enjoy the views of the clouds live wallpaper on thephone and make an eternal summer. You'll feel like you every timeyou look at your phone's time in the holidays. All worries willdisappear and you will relax. To experience this feeling, setting abeautiful cloudy sky and blue sea wallpaper, which will make theatmosphere more pleasant. For more romantic person has a skybackground, which will inspire your passion and feelings. Starrynight sky wallpaper is for you and your phone perfect solution. Itwill remind you that you should enjoy your love life every second,and love with you, if possible. Sparkling effect will aggravateyour phone's beauty then this romantic wallpaper will look like asky wallpaper 3D. Get the best for themselves and Galaxy phones. Tomake it look fresh and new with "Sky HD Wallpaper." So now the skyis clear once again, all the clouds are gone, you can enjoy thisbeautiful sky wallpaper. Cheers! We offer simple, fast, and professional servers that will allowusers to access all kind of satellite and cable channels, HDs, 3Ds,Premiums and PPVs.We do provide support that is available 24 hoursa day, 7 days a week. Support options include ticket support, emailsupport and website tutorials. If you have any questions, therewill always be help available.We take pride in our work andeverything we create is executed with precision and love.